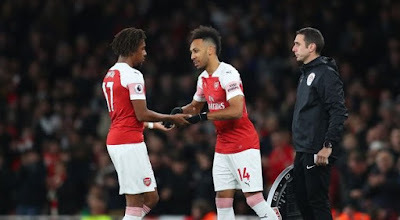 Pierre-Emerick Aubameyang has been passed fit to make the starting lineup when Arsenal host Napoli on Thursday night. The Gabonese international began from the bench in our last two games which were with Newcastle United and Everton. This made supporters to demand knowledge of why Unai Emery made such a decision, with some thinking the Spanish boss now prefers Alexandre Lacazette to him. Illness was the factor for Aubameyang's relegation to the bench, says Emery at his press conference ahead of tonight's Europa League fixture. Arsene Wenger's successor has now cleared him for a return against Carlo Ancelotti's side who are second in the Serie A. "He's getting better and can start," the Arsenal boss said. "He had a small problem and he has taken antibiotics for his illness. "That's the main reason he didn't start those two matches." The situation with Laurent Koscielny and Granit Xhaka is still the same as we reported yesterday. The duo will only feature if there is a positive result from a late assessment. Xhaka and the French defender have not made an appearance for the Gunners since the conclusion of the international break owing to groin and foot problems respectively. Without the pair, Arsenal is still expected to field a decent side with Lucas Torreira now available for selection once again following his omission from our last three league games.